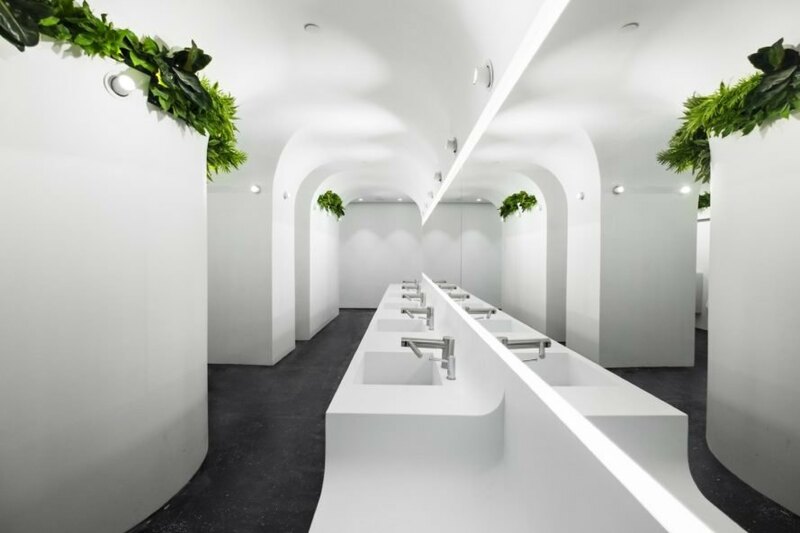 Hong Kong-based design practice Ida&Billy Architects have completed an unusually eye-catching bathroom redesign for a Guangzhou shopping mall that boasts striking looks and sustainable elements. 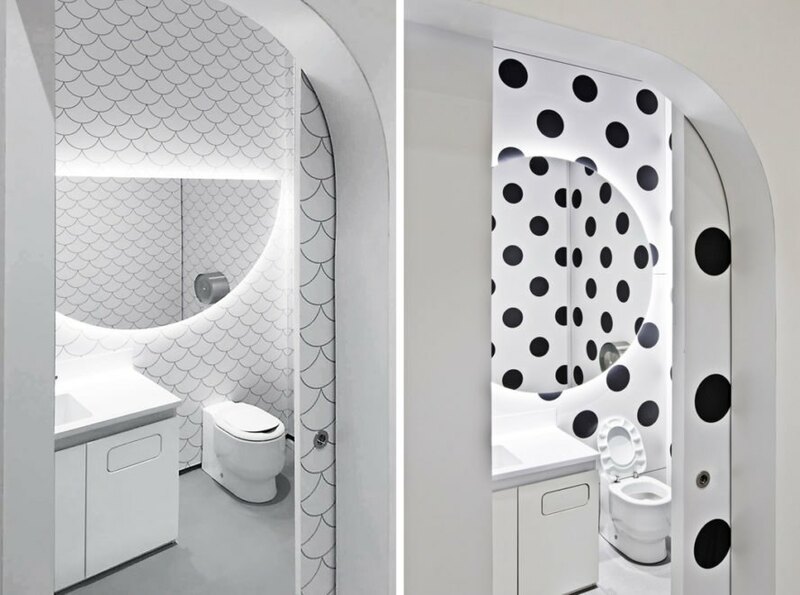 Crafted with human comfort in mind, these renovated toilets at the TaiKoo Hui mixed-use development are almost a destination in themselves due to the colorful patterned aesthetic, sculptural clean lines and adherence to green design principles. In addition to the use of recycled materials and gray water recycling systems, the eco-friendly bathrooms also feature air-purifying indoor plants. 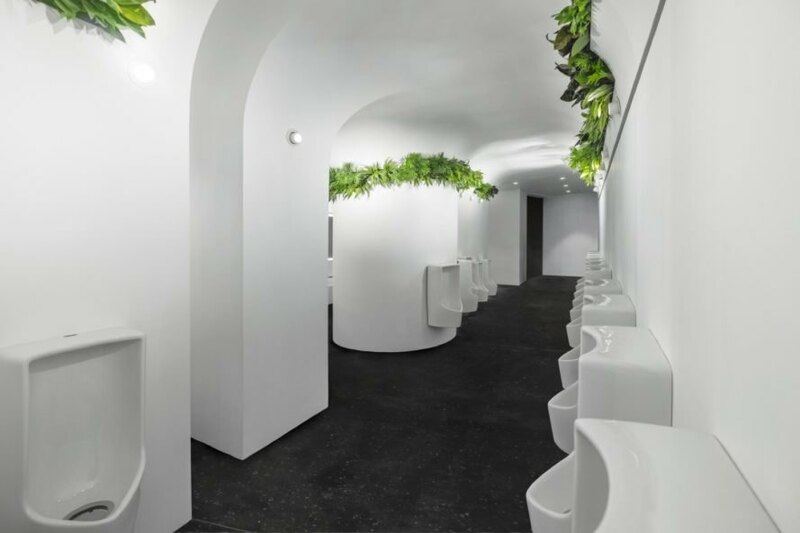 Tucked underground, the bathrooms at TaiKoo Hui are designed to embrace their subterranean location with a modern grotto-like appearance featuring curved doorways and openings. White paint brightens up the curved walls while LED strips illuminate the space. The original bathroom layout was preserved during the renovation to minimize structural and piping changes. The original sandstone and gray tiles were crushed and turned into aggregate for the newly cast dark gray terrazzo floors. 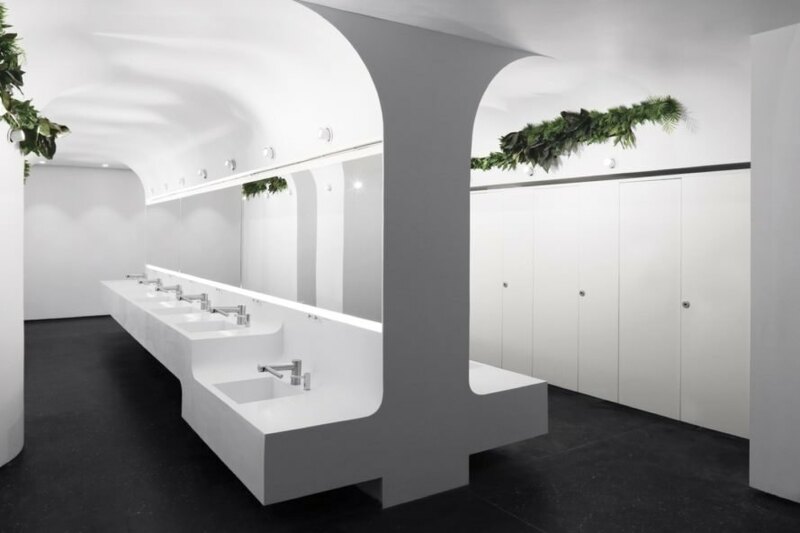 The architects chose glass fiber reinforced gypsum (GRG) panels (made with recycled content) to create the curved surfaces that seamlessly connect the walls to the ceilings in the eco-friendly bathrooms. Aided by two fans for circulation, indoor plants improve indoor oxygen levels and bring a splash of green to the windowless space. Collected and filtered gray water is used for irrigation. The waterless urinal and water-saving toilets are estimated to save water usage by 80 percent and reduce waste by 60 percent on a daily basis. Indoor plants were selected for their air-purifying qualities. Gray water is collected and filtered for irrigation. 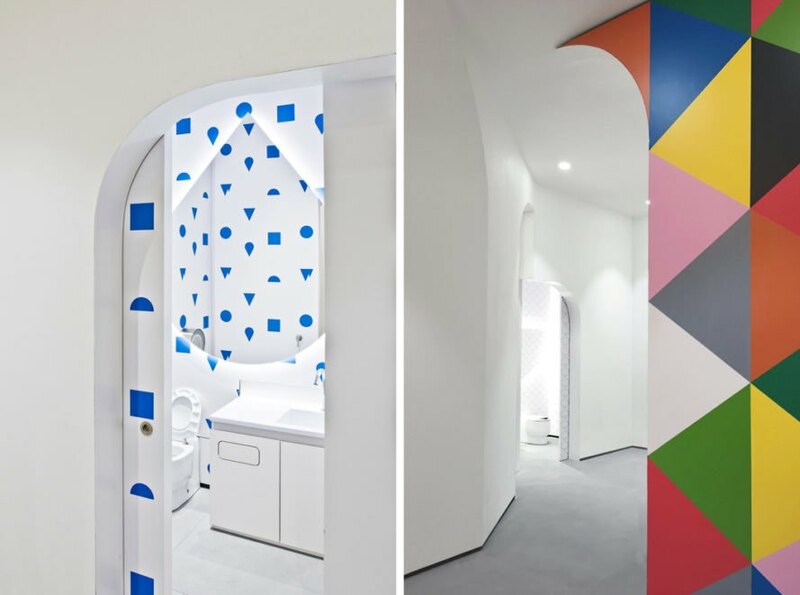 Some of the children's bathrooms are bright and colorful. The waterless urinals and water-saving toilets are estimated to save water usage by 80 percent. The kids' bathrooms also have more muted colors with fun patterns. The white walls curve up to mimic a grotto. Diagrams for the children's bathrooms. Plan and sections for the men's bathroom.